It is an ancient Mayan city renowned for its stylish architecture adorned with intricately carved facades. It is the tallest and most striking structure - and sports a unique oval contour (see photo). Legend says it was built overnight by a dwarf magician to meet a challenge. Becoming the ruler was the prize. Another leading attraction is the Nunnery Quadrangle, a large courtyard surrounded by four long buildings with ornamentally sculptured facades. A Spaniard gave the Nunnery its name in the 1500s. He thought that the complex and its many small rooms were similar to Spanish convents. Its real purpose is uncertain. This structure boasts an elaborately designed carved facade measuring nearly 100 meters (320 feet) in length. It is shorter than the Pyramid of the Magician and is in a mixed stage of restoration. 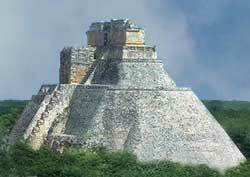 Climb up its stairs for a panoramic photo of Uxmal.